Soak rajma for about 8 hours. Pressure cook for 5 whistles. Drain water and mash it. Soak bread by sprinkling some water. Make sure it is not too wet otherwise it will soak more oil. Take a bowl. Add beans, bread, ginger-garlic paste, green chillies, red chilly powder, turmeric powder, aamchur powder, salt and mix it well. Grease your hands with oil and make small tikkis. Take a flat pan and heat it. Add about 3 tablespoon oil. Arrange tikkis on the pan and cook it on medium to low flame till it is done. You can arrange about 10-12 tikkis at a time. Add more oil if you feel it becomes too dry. 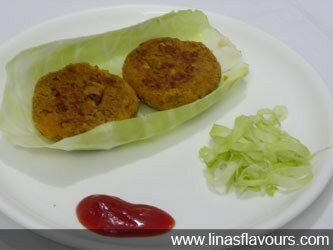 Serve it with any salad and tomato ketchup. You can even use it in the burger.